Memorial Day, the unofficial start of summer, was this past Monday. After a busy weekend with the annual Feast of the Flowering Moon and demolition derby Bash for Cash, June is gearing up to be a busy month with events and attractions. Area attractions are open for business and many will continue their season through the fall. In addition to regular tours, many attractions offer special events and activities for children and families throughout the summer. 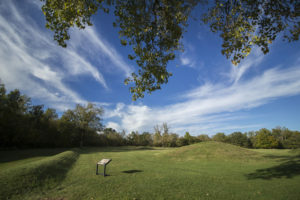 An exciting piece of news came out last week as the official invitation through the Federal Register was issued for the Hopewell Ceremonial Earthworks nomination towards inscription as a World Heritage site. This invitation was the next step in the process that organizers have been striving to obtain. Opening this weekend is the Chillicothe Paints season. Starting off on Friday, the Paints will play against the Kokomo Jackrabbits. Following the game is the spectacular Fireworks Extravaganza presented by the Chillicothe Gazette and 94 Country. If you’re wanting to follow the Paints’ season, you can pick up one of their pocket schedules at our office. 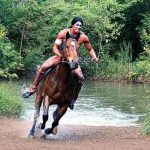 Next weekend features the opening of “Tecumseh!” Outdoor Drama on Friday, June 8th. Tecumseh’s season will run through September 2nd. Each night (except for Sundays) the show begins at 8pm, but you can start the experience early with a backstage tour and dinner buffet. If you’re looking for things to do to fill your schedule while visiting or during summer break from school, there’s plenty going on this month. We’re just highlighting a few of the events taking place this month, you can find the full schedule on our Calendar of Events. This Saturday (June 2nd) is the Chillicothe Spring Nationals Monster Truck Showdown – which is why you’ve seen monster trucks around Chillicothe this past week. This event has everything you need for an evening of excitement with monster trucks. There will be giant national TV Monster Trucks – Heavy Hitter, Extermigator, Basher and Razin Kane at the event. Following the performance there will be a post-show Drivers Autograph Session and a chance to ride on a real monster truck. You can find more details about this on our calendar. If you’re looking for things to do that isn’t held outside, there’s plenty of theatre entertainment happening in June. The Majestic Theatre will be showing the film “Who Framed Roger Rabbit” and hosting concerts by Shane Runion (featuring Jonalee White) and Alexis Gomez (along with Ross County Idol winners). The Paxton Theatre will host the band New Again this month. Finally, although it’s in the amphitheater and not inside, The Scioto Society continues its Bluegrass series with Rhonda Vincent and the Rage. If you help organize an event make sure to contact us with the details so we can add it to our calendar. Guidelines for event submissions: The event must take place in Ross County, open to the public, and without political or religious endorsements. Some postings for fundraisers and community yard sales are at the discretion of the Bureau. Submit your events to info@visitchillicotheohio.com. You can find details for what we need to post by using our Calendar of Events Form.